Find out more here about some of our older pages and see how St. Hilary's Miniature Church has grown and changed over the last few years! Poppy was one of the first Sunday School children to join St. Hilary's! She was soon joined by her baby sister, Clarissa, and then Clara, Tom, Ben, Amelia and Emily. 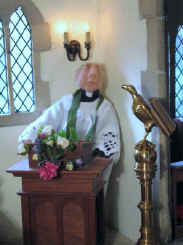 However they needed a vicar all to themselves because they were having to share one with a neighbouring village parish. I arrived from Australia and took all the children and congregation under my wing! When I arrived St. Hilary's was a very small church! It didn't even have any proper windows at all! Pity poor Homer, a man of the road from Germany who, before the extension was built, used to almost freeze to death in the Winter if he had nowhere else to stay at night! Rita came to St. Hilary's all the way from Australia! She also has problems finding places to stay as she, like Homer, lives on the streets too. She loves to rest on top of the bell tower stairs when visiting so that she can see everyone who arrives at church. See me preach to the children for the very first time at my first Communion service! Homer and Rita decide to come and listen to me too! Rev Ken arrived in December 2004 just in time for St. Hilary's Christmas celebrations. Poppy, Rev Ken's daughter, was thrilled her Daddy was coming to St. Hilary's as the new curate. See how he did as he introduced the congregation and children to the new processional cross as he carried it for the very first time! EVERY church should have a proper brass eagle lectern........and so we were thrilled to receive ours! See it as we all did for the first time when Nunc Dimittis, our resident church mouse, thought it was a new home for HIM and his pals! I was very happy to finally have a lovely surplice made for me by one of our needlecraft ladies (September 2005) to wear with my black cassack! You can all see me here wearing it for the very first time as I preached during one of our Summer flower festivals! You can all see the eagle lectern which had also not long arrived in St. Hilary's! We were all very keen to have an extension to the church because the Sunday School and congregation had grown and we all simply did not fit in to the original sized church! However...........we had a problem.......we needed money to help build it. And so I had a brilliant idea to raise funds and so we held a Coffee Morning! Visit and see how well we all did..........and see the plans of the church and extension BEFORE it was built. See our new tea trolley for the first time too as it is used by Alice to serve tea, coffee and cakes to everyone. It was soon after we had our extension built that we were excited to learn that our Sunday School teacher, Miss Esther, was going to marry her long term sweetheart, Stephen. They had THE most wonderful Wedding! Tom was there, of course, with his camera to take the official photographs.......check out his Wedding Album! Miss Esther and Stephen were thrilled when their first child, Rachel Ann was born. So were we! And so we soon had a wonderful baptism service for her here in St. Hilary's. See our Baptisms page and find out how Rachel Ann's and Clarissa Elizabeth's christening services went! We soon decided we needed a new pipe organ so that we had our own music and accompaniment for our hymn and choruses. We all had great fun holding a Coffee Afternoon in order to raise funds for our new pipe organ. It was with great excitement that the children and congregation gathered on the first Sunday morning for the Blessing of the new organ! You may all think that St. Hilary's was almost complete now we had our new extension and new pipe organ. However...........we were STILL missing something very important from our bell tower......working bells! See how our Blessing of the Bells went one Easter Sunday morning and find out which saint the biggest bell was dedicated to! I am very keen that we have a proper choir in St. Hilary's! However..........we needed some choir stalls in our new chancel first! So, when our new choir stalls arrived, we had them consecrated on Palm Sunday in 2007! In the year 2007 saw the children learn how to Make a Christingle. Visit and see how they did and then take part in a Christingle Service and read the Christingle Sermon provided for us by the now saldy late Jan Craven, who was licenced to preach on behalf of the Children's Society. It was great to hear that the Children's Society wanted to include a photo of our children in their 2008 Christingle leaflet too. The children were VERY proud! I was very keen to have a new brass and wood altar rail and so we were thrilled when a benefactor agreed to let us have one. See how the blessing of the new altar rail went at one of our Harvest Festival services! I would like to say the service and blessing went smoothly..........but sadly it didn't........quite! Esther and Stephen's baby daughter celebrated her first Mothering Sunday (2008) - see how she enjoyed it! See the beautiful Spring flowers box that sits outside St. Hilary's church. The children particularly loved the Pentecost celebration in 2008! The vicar brought some potatoes and oil to church and they had a egg and chip lunch to celebrate after the service! I will never forget the surprise Adele had on Easter Day in 2008 when this lamb turned up at the door step....that WAS an interesting service! The children's Christmas project in 2008 was that "Operation Christmas Child".........see how they did when they were choosing their shoe boxes where there was a little tussle between two of the children and then when they were filling and wrapping them! See how everyone in St. Hilary's is involved cleaning on our last big Cleaning Day! I hope you all have enjoyed our little potted history of St. Hils and my trip down memory lane!